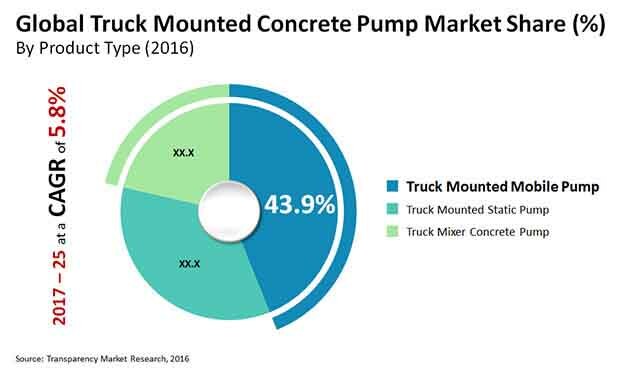 The top six players in the global truck mounted concrete pump market accounted for around 95% of the market in 2016, hinting at an extremely consolidated vendor landscape. It is noted by Transparency Market Research in a recent report that these organizations – SCHWING, LIEBHERR, Concord Concrete Pumps, XCMG, Zoomlion Heavy Machinery Co. Ltd., and Sany Group & Putzmeister hold strong foot in the market with their expanding portfolios for global business operations. Competition level is high among the leading organization and is said to remain same throughout the forecast period. To strengthen their positions in the global market, these companies are concentrating on aggressive pricing, reaching out to larger communities through expanding in new regional markets, and collaborating with other promising players. It is estimated by TMR that the world truck mounted concrete pump market will show a 5.8% CAGR between 2017 and 2025, rising from a valuation of US$2.79 bn in 2016 to US$4.64 bn by 2025. Of the key truck mounted concrete pump varieties covered in the report, the segment of truck mounted mobile pumps is presently the leading contributor to the world market. Demand for mobile pumps is likely to rise steadily throughout the forecast period as well, thanks to their increased usage in both small and big construction sites across the world. The Asia Pacific region, in terms of the market for truck mounted concrete pump market is dominating the rest of world, with a 55% of global share. Booming infrastructure development sector in developing countries such as China, Thailand, Vietnam, Indonesia, India, Malaysia, and some more countries in Southeast Asia region have surged the need for construction tools, as a result the demand has increased exponentially. Rise in the use of precast concrete structures across tons of construction projects accompanied by high impact of certain political and economic factors surrounding the construction sector across a number of countries have become a threat to the growth prospects of the global truck mounted concrete pumps market. These factors have made a negative impact on the market by bringing down demand and restraining R&D activities as companies focus on other lucrative businesses. Despite this, it has been seen that the steady pace of urbanization of several cities in emerging economies is presenting promising growth avenues before the market. Governments are spending increased funds and resources towards infrastructure development projects in order to meet the requirements of a rising population that wants to shift towards urban settings for better lifestyles, healthcare, and infrastructure in regions such as Latin America, Asia Pacific, Middle East, Oceanic Sub Region, South America, and Africa. Thus has resulted in the stream of construction across the world leading to a high demand for concrete pumps. It is expected that in the coming years these factors will continue to motivate to a healthy growth in global market.